Garbage pickers have been around forever, gathering everything from discarded furniture to books to clothing to bottles from the curb. The idea of dining on food found in garbage may be just as old, but the practice is often associated with the needy. Adam Weissman, well-known NYC animal activist and rabble-rouser, scoops up leftovers our consumerist society and wasteful restaurants throw away. A leader in the growing freegan movement, Adam is not homeless or unemployed, yet chooses to use and eat discarded items. But it’s not that gross. Golden delicious apples, fresh whole wheat walnut bread, unopened bags of Tings—these are just some of the perfectly edible foods freegans find and consume. Kymberlie Adams Matthews, who has her share of food issues, was turned on to the idea and the philosophy behind freeganism by Adam Weissman. Okay Adam, what is freeganism? Freeganism is a strategy for preventing waste, saving money so we can work less, and minimizing the impact of our consumption. Freegans are building a culture where people voluntarily help and share with one another rather than competing for resources. We seek to reclaim control of our lives from an economic system that turns us into wage slaves and makes us complicit in the exploitation of the environment and human and nonhuman animals. Under capitalism, the prime motivator for businesses selling goods is not to serve consumer needs, provide for their workers or improve the overall state of the world, but to generate profits for their investors and owners. Even products marketed as “green” or “vegan” operate on the same principle, their “greenness” becomes a selling point to consumers, while obscuring exploitative aspects (e.g. labor exploitation, shooting and trapping of wildlife). Simply put: freegans seek to prevent waste by reclaiming, recovering and repairing available resources rather than generate new profit. For many people, it seems an impossibility to live a freegan lifestyle. I completely understand why you do it, but how do you do it? We focus on urban foraging, recovering wasted food, books, clothing, office supplies and other items from the refuse of retail stores. Most items are frequently discarded in brand new condition. We also make use of wild foraging, using wild-growing plant foods and medicinals. These can be found everywhere from the deep woods to a city park. Sharing the wealth instead of adding to the waste is important too. On email lists like Freecycle, websites like Craigslist, fairs like the “Really, Really Free Market” and in permanently established “Free Stores,” people donate items they don’t want and others find things they can use. We also repair and mend items instead of tossing them out and hold workshops to teach others to do the same. We typically squat, finding abandoned, decrepit buildings and restoring them into homes and community centers for low-income families. Squatting challenges the values of an economic system where homeless people freeze to death on the streets while landlords and municipal governments sit on boarded-up buildings. Freegans also convert garbage-strewn abandoned lots into beautiful garden plots amidst the asphalt and concrete of urban neighborhoods. The gardens are refuges for urban wildlife and allow communities to grow their own food in neighborhoods where supermarkets under-stock healthy fruits and vegetables. Aside from not partaking in the evils of consumerism, how else does freeganism help the environment? We see automobiles and the petroleum economy as a social and ecological disaster and promote more sustainable methods of travel. Bicycling is healthy, nonpolluting and requires no fuel cost, so volunteer groups called bike collectives teach people to repair abandoned and broken bikes. Hitchhikers and freight train hoppers continue a time-honored vagabond tradition of traveling with minimal means in a car-obsessed nation with inadequate and prohibitively expensive passenger rail lines. Freegans who find cars unavoidable avoid petroleum dependence by converting their diesel engines to run on used grease from restaurants, turning a waste product into an ecologically-friendly fuel. We also believe goods should be designed to last and preserved for longevity. Freegans use rags over paper towels, handkerchiefs over paper tissues, and carry mugs rather than use disposable cups. In the process we save money and conserve natural resources. Is it true that freegans support the idea of working less? Freegans resist manipulative advertisements that tell us we can find happiness and self-worth on retail store shelves. By buying less “stuff” and taking care of vital needs without paying money, we are able to work less or not at all. This is motivated not by “laziness,” but by a desire to devote time to community service, activism, caring for family, etc. Do you eat free meat or dairy and eggs? I don’t, but I have no ethical objection for those who recover discarded animal products. I think the meat and dairy industries are hideously evil, but our complicity with them is primarily at the cash register, not the dinner table. In a capitalist economy, McDonald’s doesn’t care if we use their hamburgers for frisbees, so long as we buy them. I’ve heard many vegans argue that consuming animals’ bodies is disrespectful, and I’m baffled by what measure of respect is afforded to animals by letting their discarded corpses end up in landfills or incinerators. Personally, when I die, I want my corpse dumped in the woods so that it can feed other animals. Living beings have always consumed dead beings, keeping matter and energy a constant part of the life cycle. That said, most freegans also recognize an important distinction between free and recovered goods. Within the vegan community, there is a wildly inaccurate stereotype of freegans as being people who are otherwise vegan but will eat any non-vegan foods given to them by others. Freegans recognize that if someone buys a non-vegan food and offers it to another, the manufacturers are still turning a profit. But there must be some things you need to buy…? It is obviously difficult to live in absolute terms, so freeganism lacks the all-or-nothing absolutism of veganism, focusing less on personal purity and far more on making alternatives widely available and practical, so that large numbers can practice ethical living strategies, not just a small number of lifestyle martyrs. Let’s get personal. Would you go to a restaurant on a date or would you take them dumpster diving? Dating? Who has time for dating? I spend almost every day doing interviews like this! [Laughter.] Okay Adam, be honest, have you ever gotten stuck in a dumpster? No. I do very little actual climbing into dumpsters. In Manhattan, very few stores use dumpsters, but instead discard bags on the curb. Still, I’ve certainly climbed into my share of dumpsters in suburbs and it’s never been a problem. Pretty fun, actually—vaguely reminiscent of those ball pits kids play in at amusement parks, only filled with usable goods instead. I have the best mental image of you playing in a dumpster now! Okay, so for real, what did you have for lunch today? Coconut, mango, taro root, banana and okra. Yum! Where do you usually go for breakfast? My refrigerator. I restock my fridge about once a week during our group foraging expeditions. I constantly find far more than I can use at city supermarkets. In fact, I usually find so much that I gather all that I have the strength to carry, redistribute as much as I can to people I run into on the street on my way to the bus station, often giving away about 30 pounds of food, and still am left with a week’s worth of food! Switching gears a bit, are you concerned that exposing this unorthodox lifestyle will hurt the vegan movement because it makes it seem fringe and crazy? Do vegans worry that publicizing veganism will hurt the movement for human rights in Latin America? Freeganism and veganism are two entirely different ideas. It’s true that the word “freegan” is derived from “vegan” and that confuses many people. But the word freegan was chosen largely to satirize an attitude prevalent among many vegans who seem unconcerned about the social and ecological impacts of the goods they purchase—so long as they are vegan. Sweatshop-made Nike shoes are fine, as long as they aren’t leather. Chocolate soymilk is great, despite the destruction of rainforests, exploitation of child slaves in the African chocolate trade and use of GMO plants. The term freegan was created to express the notion that to live the “cruelty-free” lifestyle vegans advocate, we need to remove ourselves as much as possible from the capitalist economy, rather than taking the tunnel-vision perspective that we should only be concerned about animal flesh and secretions. To many vegans, freeganism may seem marginal or extreme, but it’s important to remember that veganism seems “normal” and “acceptable” from within the context of the vegan community. Yet many vegans fail to recognize that the organized vegan community reflects bourgeoisie, white, liberal cultural norms, and to people outside of this demographic, eating tofu instead of hamburger can seem far weirder than getting good food that a store has needlessly thrown away. But, Satya readers may wonder, why would people who don’t choose to be vegan want to adopt a freegan diet? It’s important to remember that freeganism is a really all-encompassing response to a wasteful, profit-driven culture. Even if people don’t care at all about animal rights, but are concerned about things like labor exploitation, the ecological impacts of overconsumption, the injustice of wasting resources, or just like the idea of getting stuff for free, freegan living is a really appealing notion. And let’s be honest, there are lots of people who don’t like the idea of animal agriculture, but just can’t bring themselves to give up meat, dairy, etc. We can look down on them and call them murderers and weak-willed hypocrites, or we can try to meet them halfway which, after all, is what we are doing by encouraging people to buy meat analogs. If we tell meat-eaters who are sympathetic but just can’t bring themselves to kick the meat habit that there is a way they can continue consuming animal products without economically supporting factory farming, they just might go for it. So you think freeganism could have a major impact on the agricultural industry? If significant numbers of meat-eaters start recovering rather than buying their meat, this, compounded with effective vegan advocacy, will make the sale of meat far less profitable. A significant drop in sales will leave stores ordering less, which may at first lead to a costly product glut, but will result over time in less production. Adapting to producing for a smaller market will no doubt be expensive, and considering the economics of scale, will mean a far higher per-unit cost on each item. Subsidies will at first keep prices low, but a smaller, less profitable meat industry will lose influence with politicians, who may feel they have more to gain by championing tax cuts than by providing welfare to a dying industry. At this point, meat prices will go even higher, and more consumers will look for an alternative way to acquire their meat. This may all seem far-fetched, but in a world where scientists are genetically engineering heart-healthy pork, is it any more unrealistic than thinking the whole world is going to go vegan? Veganism, freeganism and large-scale economic sabotage may very well be the combination that will ultimately destroy the meat industry. 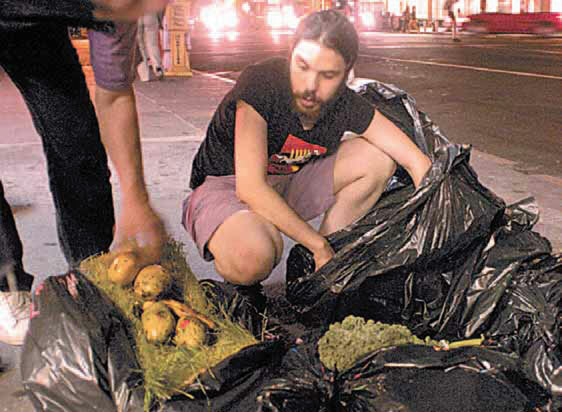 The ideals of freeganism—and you in particular—have been in the media quite a bit lately. What has the public response been? Within the last two years, freeganism has generated an unprecedented tide of mainstream media coverage—much surprisingly respectful, some even laudatory. Literally millions of people are learning about freeganism and seeing freegans as serious people championing an important cause, rather than as freaks rummaging in garbage. And because TV coverage has shown the goods we recover are of superb quality, people’s expectations of dirty and decaying food are being dispelled. Every time we hold trash tours, we see new faces, new people wanting to find ways to reduce their consumer impact. I think it’s also important to remember that while foraging for food is the “kooky” practice that media has focused on, it’s only one small component of the overall freegan lifestyle. People are certainly free to avoid this practice and embrace the many other aspects of freeganism. We find that over time, people who at first are wary of freegan food but are friends with freegans or participate in freegan community activities soon warm up to freegan eating. They might accept an innocent-looking bagel, then eat a delicious meal prepared by a freegan, then nervously join a “trash tour” with a friend, see bags overflowing with pristine goods and vow to never buy food again. Right, but we live in NYC and there are food temptations on every street corner. Don’t you ever crave fresh foods? The image that freegans are martyrs consuming scraps and rotten items is completely a myth. In reality, most freegans find that they are able to eat much better than they would as purchasers. Most retailers vastly overproduce and over-order, to the point where on a daily basis they are throwing away enormous quantities of goods. In some cases, chain supermarkets will throw out unopened cases of new products (eggs, salad mixes) because the shelves are already too full—meaning that freegans are actually getting fresher foods than the customers paying for the same items! By and large the vegan community hasn’t confronted the reality that in this culture, you need to be well off to eat well. Go to Whole Foods and pick up a package of organic spinach and it will set you back $6. Go to Burger King and you can order off the dollar menu. For many people, one of the primary motivations to recover discarded foods is access to enormous quantities of high quality foods—organic produce; fresh organic, whole grain bread; gourmet prepared foods, etc. One of the best marketing schemes going is sell-by dates. Products are often dated long before there is any decline in quality. This ensures that stores will keep throwing products away and consumers will do the same (a recent study found that the average U.S. family wastes $590 in usable food every year). Stores won’t sell past the sell-by dates for concerns about image and liability, and consumers won’t use goods past them for fear that they are unsafe. But this is really just another form of manipulation—akin to the computer company telling us last year’s computer is obsolete or the fashion designer telling us our clothes are out of style. But even if someone chose to only eat goods before their dates, this is easy on a freegan diet. Most stores throw away goods well before they even reach sell-by dates, because they toss the entire older shipment as soon as the new shipment of a product comes in. Also, bakeries, pizzerias, fish markets, rotisserie chicken sellers and lamb sellers (yuck), donut shops, bagel shops, salad and sandwich shops, restaurants, delis, and health food stores with buffets design their business to throw away everything they don’t sell as soon as the store closes for a given day. The goods freegans recover from these stores were on sale minutes earlier and are often still steaming hot (or cold and fresh). I collect discarded furniture, books and other stuff from street corners, and although you have me warming up to the idea, I stay away from the food. Am I considered a freegan? What inspired you to take on this lifestyle? Animal rights psychologist Ken Shapiro once described animal rights activists as “caring sleuths,” people who keep their eyes open to injustices around them that others might not notice, and this is a pretty good description of me. As I became more aware of the ways my consumer choices were impacting others, I progressively made changes in my lifestyle, first by going vegetarian, then by going vegan, then by eating only organic foods. Then I became increasingly aware that “organic” did not mean “animal-friendly.” Organic farmers will shoot, trap and poison mammals, birds and insects as readily as non-organic farmers—they simply won’t do it with petroleum-based pesticides. And of course, many organic farmers subsidize animal agriculture by using factory farm manure to fertilize their crops. Even agriculture practices not intended to harm animals cause massive numbers of deaths—machine threshers chop animals to bits, animals on land or in dens are crushed under agricultural machinery, small animals are shredded as soil is tilled. I came to realize that for an animal liberationist, an organic, vegan diet was a lot like buying meat at the supermarket—being complicit in animal oppression, but letting someone else do the dirty work, so we don’t have to think about it. I then stumbled upon the enormous volume of waste generated daily by retailers, and realized that I could fully satisfy my need for food by consuming goods that would otherwise go to waste. I could actually have a positive impact, by rescuing goods from the waste stream, from further contributing to the garbage crisis. On a day-to-day basis, that may not seem like a big deal, but over the course of years, by living this way, the amount of stuff I prevent from ever reaching a landfill is considerable. And I compound that impact when I encourage others to do the same. To learn more and get involved, visit www.Freegan.info.